Minimally invasive surgery fellowship in South Miami under the guidance of Drs. Moises Jacobs and Gustavo Plasencia, both well respected and admired in this vastly developing field of laparoscopic surgery. Five-year general surgery residency at Botsford General Hospital, a Michigan State University affiliate, Farmington Hills, Michigan. Aeyal Oren, D.O. is a general and laparoscopic surgeon, licensed in the State of Florida. 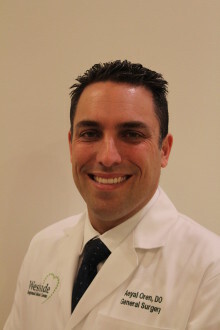 Dr. Oren grew up in Plantation, Florida, where he currently is in private practice. Dr. Oren attended Tulane University, graduating with a Bachelor of Science degree. He then attended medical school at Nova Southeastern College of Osteopathic Medicine and received his Doctorate of Osteopathic Medicine. Dr. Oren completed his five-year general surgery residency at Botsford General Hospital, a Michigan State University affiliate, in Farmington Hills, Michigan. Dr. Oren then completed a one-year advanced minimally invasive surgery fellowship in South Miami under the guidance of Drs. Moises Jacobs and Gustavo Plasencia, both well respected and admired in this vastly developing field of laparoscopic surgery. Dr. Oren is an active member of the American Osteopathic Association, the American College of Osteopathic Surgeons, and the Society of American Gastrointestinal and Endoscopic Surgeons and the Florida Osteopathic Medical Association.